When getting a dog, grooming is one of the main factors you need to consider. Do they need a lot of brushing? How often do they need to have their haircut? This can soon add up, especially with long haired breeds that need to go to the groomers every 4-6 weeks. I do all the grooming of my dogs myself. I have worked in a groomers so know how to do it all, but what’s stopping you from learning how to groom your own dog? I added up how much it would cost me over a year if I sent Woody and Wilma to the groomers instead of doing it myself. Woody who is hand stripped every 6 weeks would cost £346, Wilma who is shaved every 4/5 weeks would cost me £585. So all together I am saving a LOT of money, even with the expense of all my grooming equipment. Always go to a groomers if your dog is matted. It can be so painful for them, but the groomers can deal with it safely and appropriately. They may have to shave them very short to remove the matting. But that just means you can start afresh and keep on top of grooming from then onwards, we all learn from our mistakes! I’ve written a basic grooming guide for Cockapoo/Doodles in a blog post here. However this will be the next step up with actually cutting your dogs hair. 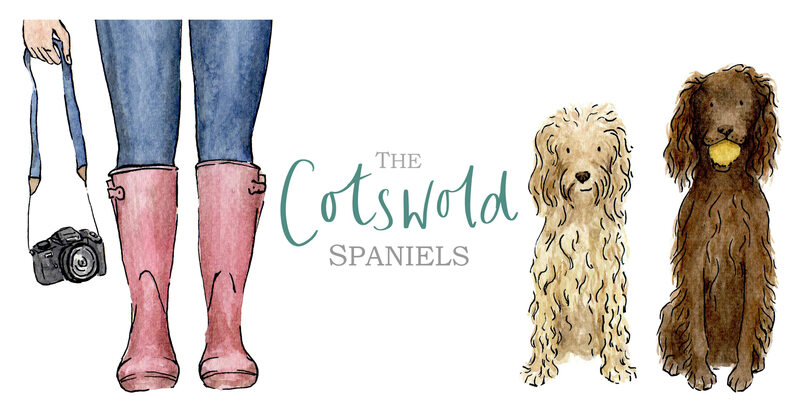 Spaniels are double coated so shouldn’t be shaved as it will damage and change their coat, if you own a double coated breed you can see how I strip them in this post. But for doodles/poodles that are single coated then shaving is the way to go. So the prep is everything; different groomers may do it slightly differently but it’s whatever works for you. To start off with I bath and shampoo Wilma, getting rid of any muddy paws, stinky smells but mainly just to get her wet all over. A quick towel try to get the excess water off then we go to the grooming table. I then use a ‘blaster’ essentially this is a super powerful hairdryer. It quite literally blasts all the water off the dog, parting the hair as well which is where groomers can easily see cuts, ticks or even fleas on a dog that have been hidden by their fluff. Sometimes an extra dryer is also used thats a little bit gentler but allows you to brush their coat in the opposite direction at the same time as drying. This is the perfect finishing touch and makes them look like a fluffy marshmallow. Once the coat is fully dry [You will not get an even cut if any fur is left wet] then you can start clipping. If your dogs aren’t comfortable using the blaster dry them as much as you can with it then leave them to dry naturally. You don’t want them to dislike it so little and often with lots of praise will get them used to it. I like Wilma’s coat being long, but manageable for a wet and muddy dog. To decide on the length of coat you choose the right attachment for your clippers. I bought a set of 8 attachments ranging from 3-25mm, for this groom I chose 19mm. Andis Grooming sent over their And is AGC2 Super 2 Speed Clippers in Fuchsia Pink, and I couldn’t wait to try them out! With most grooming kit you get what you paid for. So the more you pay the better the blade quality and cut of your clippers, scissors etc meaning a better overall finish on your dogs. And having tested out a budget clipper from a high street store to compare it to these it proved just that! Each breed has a standard cut which groomers will follow, but at the end of the day it’s your dog so you can choose what you’d like. I’m quite particular with how my dogs look which is another reason I like to groom them myself. So for Wilma I shave her body all one length. Follow the shape of their body, moving from head to tail, you should never go from tail back up to their head [Unless they’re a poodle as they’re the only breed that can be shaved in any direction]. So I start from beneath Wilma’s head fluff, down her neck, back, sides & chest to the top of her legs. Then legs, face and stomach using thinning, curved and straight scissors to level out the fur to the same length as the rest of her body. Overall I am very pleased with these clippers. They’re comfortable to hold, have two settings for fine and corse hair, and less importantly have a selection of colours you can choose. Although it isn’t cordless so you have to consider where the wire is hanging it does mean there’s no rush or worry about charging it in-between grooms. These clippers are about £143 depending on the supplier and colour. Christies Direct sell them here and are a reputable store but have a search for different prices. I’m curious to know why you don’t brush your dogs before bathing them? In this blog post I link to my how to groom a doodle blog post and mentioned that this is the next step following on from that post. However as Wilma is brushed every day she shouldn’t need brushing before a wash because her coat should be knot free. Clients dogs I would brush before as usually they don’t keep on top of their dogs coat maintenance.